Adams Pest Control provides professional Pest Control solutions to business in Melbourne, Geelong and Adelaide as well as neighbouring areas to these cities such as Ballarat and the Barossa Valley. Find out more about our Melbourne Pest Control team and what they can do for your business by clicking here. Find out more about our Adelaide Pest Control team and what they can do for your business by clicking here. Find out more about our Geelong Pest Control team and what they can do for your business by clicking here. Call us now 1300 933 789. We understand your business and the importance of maintaining a professional working environment for your staff and customers. Our work is guaranteed because we know our business, just like you know yours. Our extensive experience allows us to manage an extensive variety of pest problems, using an ecologically sound approach. We put our trusted reputation on the line every time because we know we can deliver the very best outcome for your business. Adams Pest Control offers the best pest prevention services, keeping commercial buildings, government building, offices, hotels, restaurants and hospitals clean from all kind of pests. Experts from Adams Pest Control can inspect your buildings and provide the necessary guidance for cost-effective pest removal services. Pestweb – a special software helps you see all reports online via one click. Adams Pest Control assists in removing and preventing pests in your home using ecologically sound techniques. With Adams Pest Control your home with be entirely free of all pests. 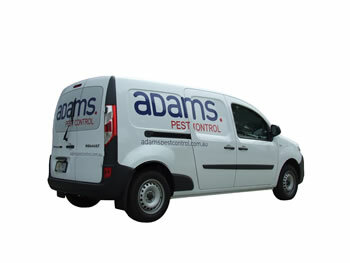 Adams Pest Control provides services for removing and controlling pests like Cockroaches, Rats, Mice, Ants, Bees, Fleas, Possums, Silverfish, Spiders, Stored Product Pests, Termites, Wasps and Bed Bugs from commercial and residential buildings. .
We service customers in Melbourne and Adelaide. © Adams Pest Control 2019. All Rights Reserved.